The Top Hut on a fine mid-winter day. 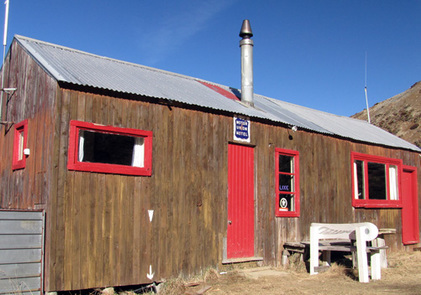 the Bottom Hut and off-site lodging in nearby resorts or towns. ​NO DOGS allowed, not in the carpark or on the field - no exception. Skiers have the option of booking into the Top Hut during weekends or ski weeks for short stays if there are spare beds. You will need to bring a sleeping bag and anything else you'll need for staying overnight, while your nightly rate will cover dinner, breakfast, lunch the following day and your liftpass if you require it. We have permanent staff on the hill responsible for various aspects of management, snow safety, catering and seeing to your needs. Your responsibility is to enjoy yourselves and contribute by doing daily duties. There is a roster on the notice board explaining the range food prep, meal cleanup and hut cleaning duties. You only do a job once so it won't encroach on your skiing or relaxing at the same time daily. Please familarlise yourselves with what group you are in, what duty and when it will occur. For details please see our Accommodation Rates. Bookings open 1st June 2019 - or see W.W.S.C Facebook (our members Facebook page) for other dates pertaining to members only. If you would like a full week package during a scheduled part week, then please email bookings@mtolympus.co.nz to request this manually. A Ski Week is the quintessential Mt Olympus experience. A week up in the Playground of the Gods will make returning to reality feel very much like you're Neil Armstrong coming home from the moon. Over 7 days you'll meet great people, share great times, ski great snow and create awesome memories. Ski Weeks run throughout the season wherever there is enough snow to open the mountain. Many of these weeks are characterised by long standing regulars and are legendary in their own right. The Bottom Hut is located at the base of the Mt Olympus valley at 1050 metres (3445 feet) and offers a more affordable accommodation solution for those on a budget or for when the Top Hut is full or inaccessible. A basic single room 12-bunk hut, the Bottom Hut offers fully self-contained, self-catered lodging with plenty of parking just 10 minutes drive (or a slightly longer walk) from the main carpark at the base of the Access Tow. Thumbing a lift from here is an option as the access road goes past the door.